Portuguese divers have rediscovered the wreckage of a Swiss Caravelle jetliner that crashed and sank off Funchal, Madeira, in December 1977. Flight SATA 730 was an international charter service from Zurich to Funchal Airport, Madeira, Portugal via Geneva, Switzerland. 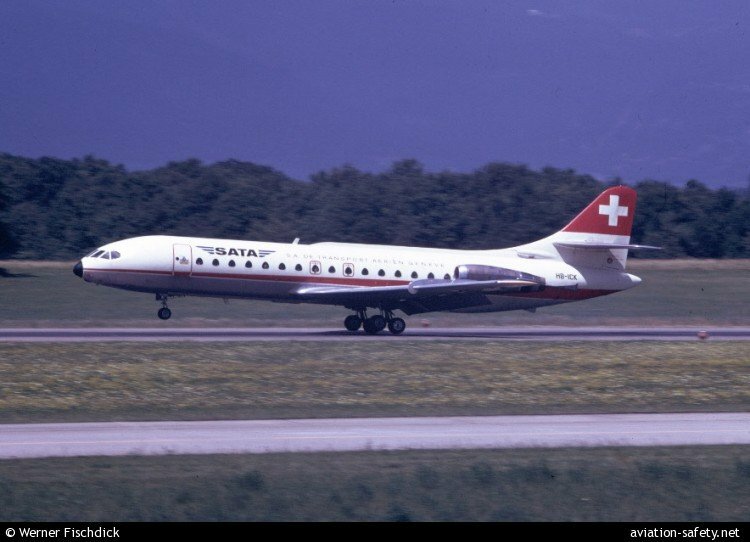 The Caravelle aircraft landed at Geneva at 14:30 UTC, December 18, 1977. Departure was delayed because a hydraulic pump had to be replaced. The flight deck crew consisted of two captains. A new captain was in the left-hand seat and was piloting the aircraft. The other captain (who was in the right-hand seat) performed the duties of pilot-in-command, pilot responsible for the initiation to Funchal, route check pilot and co-pilot. Initiation of the new captain was necessary because of the difficult approach and landing at Funchal. However, this initiation ought to have been made by day. The aircraft took off at 16:26. The flight then progressed in accordance with the flight plan. At 19:57 the crew contacted Funchal approach control, which stated that runway 06 was in service and cleared the aircraft to descend to 3500 ft.
After being cleared for the approach the crew descended below the 720 ft altitude permitted during circling, even though they had lost sight of the runway. The pilots, had lost sight of the runway lights at the end of the downwind leg and at the beginning of the base leg, when the aircraft was already flying below 200 ft. The radio altimeter had probably been preset to 200 ft, but the pilots did not check its indications. The aircraft touched the sea soon after the base leg turn. The landing gear and flaps (20°) were out. Some media reports suggest that the wreckage was finally discovered after 34 years. However, the location of the wreckage was known to rescue parties and investigators at the time of the accident.